The search for potentially life-bearing exoplanets got a hefty boost this Monday, with the discovery of three Earth-sized worlds orbiting an ultracool dwarf star only 39 light years distant from our own solar system. The planets, described today in Nature, are such close cosmic neighbors that astronomers expect to root out precise details about their masses, atmospheres, chemical makeup, and thermal structure—as well as their potential habitability—with future observations. “[With] the measurement of the masses, we should have enough information to constrain the surface conditions, notable to assess the existence of liquid water,” Michaël Gillon, astronomer at the Université de Liège and lead author of the new research, told me via email. “The most exciting part is, of course, that these observations could also reveal chemical disequilibria originating from biological activity,” he continued. In other words, astronomers hope to detect “biomarkers” such as oxygen, ozone, methane, or other substances that might have been produced by extraterrestrial life. While many of these markers can also be produced by non-biological processes, these three alien worlds are close enough to be studied with much greater scrutiny than most exoplanets, so it will be easier to pick up finer details about their habitability. “In such a case, by comparing carefully all the possible scenarios involving abiotic and biological origins to the found disequilibria, a firm (and maybe positive!) conclusion about the presence of life at the surface could be obtained,” Gillon said. Gillon and his colleagues discovered this tantalizing triplet of planets using the TRansiting Planets and PlanetesImals Small Telescope (TRAPPIST) facility in Chile, which is delightfully named for Belgian Trappist beer. 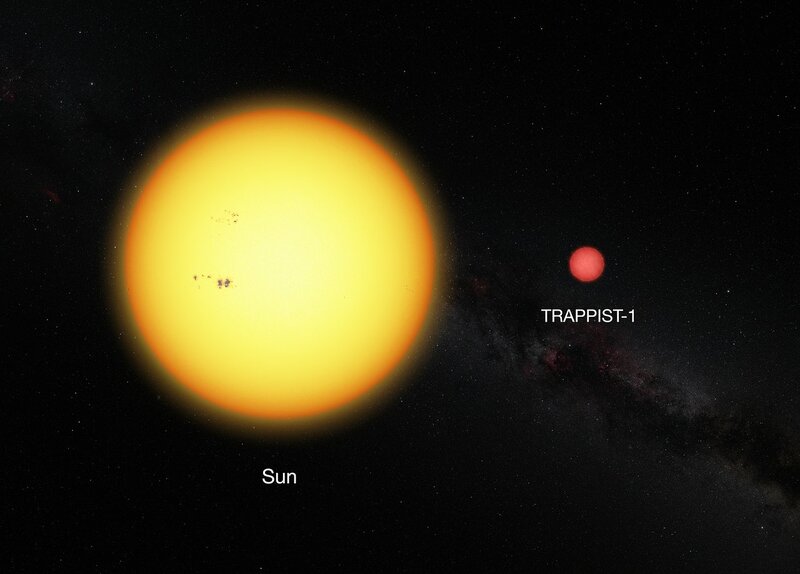 These “red worlds” orbit a tiny star called TRAPPIST-1, roughly the size of Jupiter, which is classed as an “ultracool” dwarf because it has an effective temperature below 2,700 Kelvin (for comparison, the Sun’s effective temperature is 5,772 Kelvin). The two innermost planets, TRAPPIST-1b and TRAPPIST-1c, orbit the star every 1.51 days and 2.42 days, which results in them receiving about four times and two times as much solar radiation as Earth, respectively. This puts them a little too close to their host star to be considered in the habitable “Goldilocks” zone, but that doesn’t preclude the possibility that localized life might flourish on them in certain regions (more on that later). The third planet, TRAPPIST-1d, is either within or just beyond the habitable zone, though its exact orbital period is still unclear. Based on size measurements made as the planets transited in front of their star, the three planets are no more than twice as massive as Earth, at the most. But though they are comparable in size to our own world, these planets offer a drastically different environment for any speculative lifeforms on them. For starters, all three planets occupy such tight orbits that they are likely to be tidally locked to TRAPPIST-1, much like the Moon is to Earth, which means that only one side of each planet faces its stellar host. This is a crucial factor to consider when evaluating a planetary body as a potentially life-bearing world. “The problem for habitability is that one face could be super-hot and the other super-cold, so cold that the atmosphere could freeze and collapse,” Gillon explained. The only way to find out for sure is to continue studying the TRAPPIST-1 system with even more powerful and versatile telescopes, like the upcoming James Webb Space Telescope or European Extremely Large Telescope. To get the word out, Gillon and his colleagues have just launched a new website to keep the public up to date and engaged on TRAPPIST’s ongoing exoplanetary discoveries. According to the team, ultracool dwarf star systems like TRAPPIST-1 make up about 15 percent of the stars in the vicinity of our solar system, so they are a particularly promising population to sift through in the search for proximate Earth analogs. Given that many of the most famous “Earth-like” exoplanets discovered so far are typically hundreds—or even thousands—of light year away, it’s heartening to find out that there are some premium candidates cooling their heels in our own backyard.